The Stavanger region's biggest, most exciting conference hotel! Possibilities are endless with 14 meeting rooms of various sizes and the Kitchen & Table restaurant. We are a cash-free hotel. Welcome to Clarion Hotel Energy – The Energy of Stavanger! 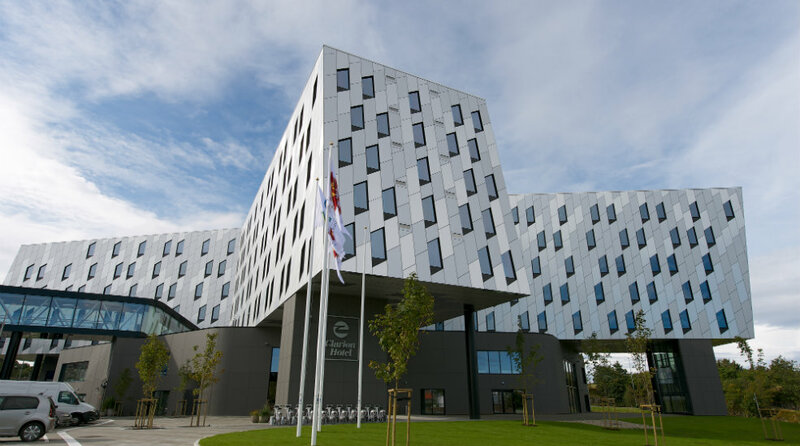 Welcome to the Clarion Hotel Energy - the most exciting conference hotel in the Stavanger region! Stavanger is commonly referred to as the energy capital of Norway. This brings with it a great business climate and a range of exciting attractions. The city is a popular destination for tourists too, coming here to watch sporting events and enjoy Stavanger's stunning natural surroundings. As the name suggests, the hotel is located right in the heart of this energy hub at Stavanger Forum, by Madla. The Clarion Hotel Energy has many different meeting rooms and flexible solutions for up to 1,000 people with a total conference space of 1,800 sqm. The hotel's ground floor features stylish furnishings by Möbelgalleri, and you can savour the lovely vibe here with flavours from the Kitchen & Table restaurant and refreshing drinks from the bar. The Clarion Hotel Energy collaborates with several local culinary partners, offering a dining experience that tastes good and gives you energy all day long! The Kitchen & Table is a restaurant concept within Clarion Hotels and an extension of the Clarion Living Room. Here we offer what we call "fun dining" rather than fine dining with a inviting, warm and relaxed atmosphere. The idyllic Mosvannet and Stokkavannet lakes, and the Sormarka hiking area are all within easy reach and are ideal for a walk, a run or a breath of fresh air! Explore the Stavanger Art Museum or do some shpoping at the Madla Amfi Senter, both just a short walk away. Find out more about Stavanger here. The airport and Sola are also close by - read more here. The Clarion Hotel Energy is a cash-free hotel. This provides a safer working environment for our staff as it reduces the risk of theft and burglary. More information about this can be found under FAQs. We hope to see you soon at the Clarion Hotel Energy – the energy of Stavanger! change for a bus here. from Stavanger city centre/Bus terminal. phone +47 51 90 90 90.